We have an awesome colour challenge for you this week at the Paper Craft Crew! I hope you’ll take some time to create your card, and join us! Don’t you love these colours? Blackberry Bliss is one of my favourites, and I’m so distressed that it will be retiring this year! 🙁 Make sure that you’ve stocked up on your reinkers and cardstock before the end of May rolls around, or you’ll be sad! For this challenge, you are to choose any 3 of the 4 colours shown, plus you can add any neutral such as Whisper White, Very Vanilla, black or brown as you need. I just keep getting drawn back to the Awesomely Artistic set! I know we have lots of awesome new sets available, but I thought I’d remind you about some ‘old favourites’ in the Annual catalogue. My idea was to create a scene with flowers growing over a crumbling brick wall. I needed to stay within the challenge colours, so I chose Smoky Slate cardstock to create my brick wall. I took the Brick embossing folder, and dragged my ink pad over the raised side – so that the indented mortar would be darker than the bricks. I love using this ink direct to embossing folder technique! After embossing, I needed to make my wall ‘crumble’, so I cut away some of the bricks,leaving just a partial wall. For my card base I used the Whisper White Thick cardstock, as I knew it had to hold up a lot of layering. I took my Aqua Painter and Lost Lagoon ink pad, and did a watercolour wash across the top 2/3rds of the card base, to create the sky background. While my card base was drying, I stamped some splotches in Smoky Slate onto my bricks, then stamped my flowers twice onto Whisper White cardstock. I used my Blender Pens and Blackberry Bliss to colour the flowers, and Old Olive for the leaves. (I did sneak in the tiniest bit of Crushed Curry for the flower centres). By using the Blender Pens instead of the Markers, I was able to create different depths of colour, and not have the flowers looking like purple ‘blobs’! Once I finished the colouring, I hand cut the flowers, and cut one of them down to a smaller bunch. 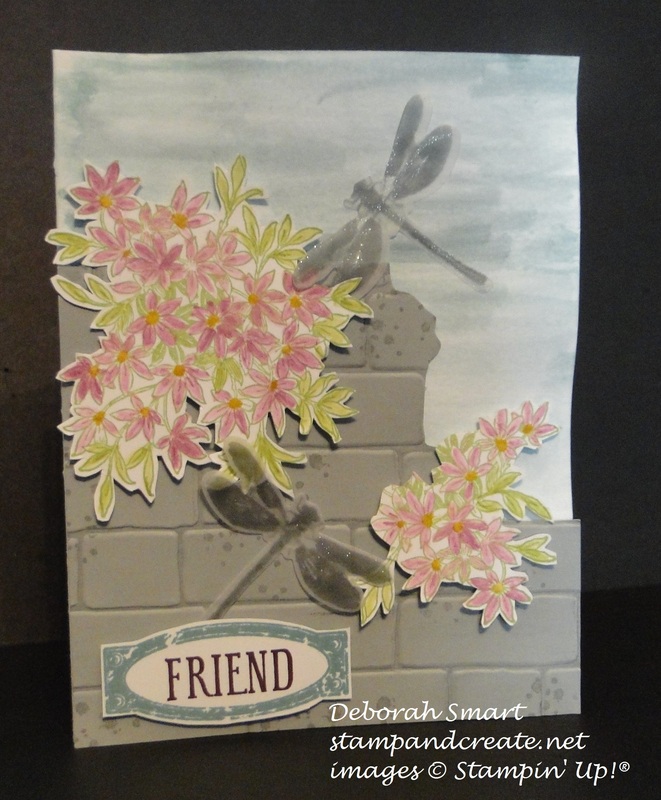 I used Stampin’ Dimensionals to attach the embossed wall to the dried card front, then added the flowers using Dimensionals as well. Next, I stamped the dragonflies in Smoky Slate ink onto Vellum cardstock, and cut them out. I added some Clear Wink of Stella glitter, the attached them to the card front using Glue Dots. Finally, the sentiment was stamped in Blackberry Bliss, with the frame around it in Lost Lagoon. Please be sure to head over to the Paper Craft Crew page, and see the amazing talents of the rest of the design team – you’ll be glad you did! I’ll be looking for your card, so please join in the challenge; you just may be our next ‘Top Pick’! Previous Previous post: Watercooler Challenge – Anything Goes! Lovely card! Interesting to see all the different colouring techniques. This is a beautiful card, Deborah! I’ll have to get that set out again and play. I love it!